MEXICO CITY (CNS) — An outspoken environmental activist in Honduras was murdered in her own home, sparking outrage and offering another example of the impunity and violence in the Central American country. Berta Caceres, who won the 2015 Goldman Environmental Prize — an award considered the Nobel for ecological actions — was murdered at around 1 a.m. March 3 in what police initially called an attempted robbery, but family members denounced as politically motivated murder, according to media reports. A Lenca indigenous leader, Caceres attracted international attention for her opposition to a hydroelectric dam on the Gualcarque River in western Honduras, where construction crews arrived unannounced almost a decade ago. A court order banned her from the area and she endured death threats, but successfully led protests that thwarted the project. “She was a woman committed to fighting for the protection of the environment and indigenous people’s territories and the common struggle,” said Jesuit Father Ismael Moreno, director of Radio Progreso and the Jesuit-run Team for Reflection, Research and Communication. “This has been what she was known for,” since founding the Council of Indigenous Peoples of Honduras in 1993, Father Moreno added. “It’s been 25 years of perpetual struggle. … She was the woman with the most recognition in all of Honduras” and well-known abroad. 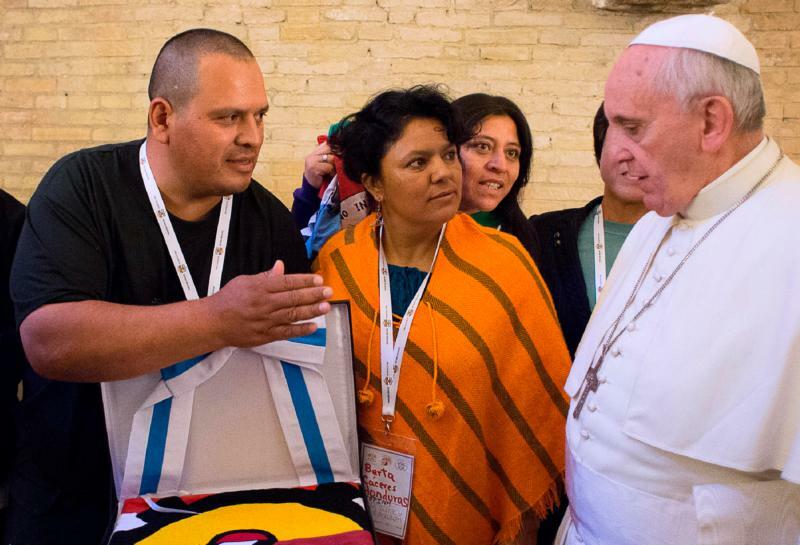 Caceres participated in the 2014 World Meeting of Popular Movements at the Vatican but was not considered close with the Honduran church hierarchy. Her actions had angered elites in Honduras, one of the poorest countries in the hemisphere and home to the highest homicide rate in the world. Father Moreno said she protested against concessions granted to foreign mining companies and was perhaps the best-known critic of a concept known as “model cities,” which creates areas within Honduras that have laws and institutions different from the rest of the country, in an effort to attract international investment. Mostly, though, she protested against proposed mines and hydroelectric projects, which were planned by foreign firms — and, her supporters alleged, she dealt with threats from landowners and the authorities. The murder brought international condemnation and calls for investigation. President Juan Orlando Hernandez condemned the killing and promised a thorough investigation. “This act causes mourning for all of us,” he said via Twitter. Police initially attributed Caceres’ death to robbery, but later said she was shot four times, according to media reports. The crime again confirms the problem of corruption and impunity in Honduras, where mass protests filled the streets in 2015 after it was discovered money embezzled out of the state social security system ended up in Hernandez’s successful presidential campaign. An international commission against impunity has been created in Honduras, following the example of neighboring Guatemala, where the president and vice president were impeached on corruption charges. Observers say it may not be as easy in Honduras. “(The commission) and the international community should have no illusions about the environment into which they are operating,” Allison said.